Create Your Own Custom Cruise Aboard A Private Yacht! A fine meal can be the highlight of your cruise. We can provide the simplest of menus to the grandest of feasts. Our usual display consists of 'welcome aboard' hot and cold appetizers and h-d'oeuves served by our hostesses, this is followed by your choice of hot entres served with salads, breads, specially prepared potatoes or rice. Our delicious deserts are prepared by Toronto's most famous pastry creators. 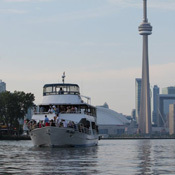 Have your dream wedding aboard the luxurious on Miss Toronto.